On its front page The New York Times weighs in today, 23 September, with the “good news” that e-book sales have fallen by about 10%. Perverse industry to be happy about a 10% drop in any format! Especially the format which has resulted in a recent profit bump! What the story, “The Plot Twist: E-Book Sales Slip, and Print is Far From Dead” by Alexandra Alter, leaves out of the calculation is the segment of the market not attributable to traditional publishing companies: self publishing and indie publishing. As the article itself admits “It is also possible that a growing number of people are still buying and reading e-books, just not from traditional publishers. The declining e-book sales reported by publishers do not account for the millions of readers who have migrated to cheap and plentiful self-published e-books, which often cost less than a dollar. . . . At Amazon, digital books sales have maintained their upward trajectory, according to Russell Grandinetti, senior vice president of Kindle. 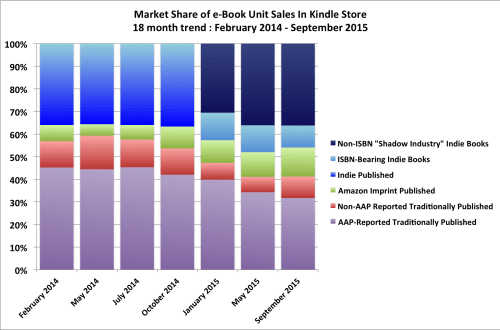 Last year, Amazon, which controls some 65% of the e-book market . . .” No need to go on. If the retailer who controls 65% of the market says sales have increased, and traditional publishers say their sales have gone down by 10%, then the conclusion (without access to the real numbers which Amazon is always cagey about) is that sales from non-traditional publishers must have increased quite sharply, certainly more than the amount represented by the 10% decline in traditional publishing product. The implications of this for the survival of print books is precisely zero. Obviously if trade publishers are selling fewer e-book, the proportion of print to e-book must be improving; but the key question is how are print sales holding up. And the answer isn’t too rosy, if not immediately disastrous. Is the real threat to trade publishing not in fact coming from a huge disorganized segment of the business, with nothing to do with format? Here, via The Digital Reader, is a graphic illustrating the problem with the NYT article.